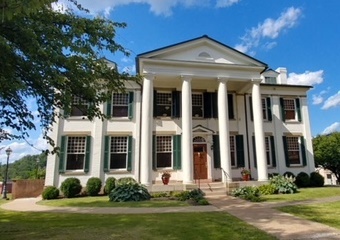 For more than forty years, the Clarksburg-Harrison Public Library's home was an elegant antebellum mansion called Waldomore. The house was built in 1842 by local businessman Waldo P. Goff and his wife, Harriet Moore, from which it derived the name "Waldomore." Waldomore exemplifies and preserves items of historical and genealogical significance for Clarksburg, Harrison County, and North Central West Virginia. Waldomore maintains a space for events of civic, cultural or educational nature; and fosters opportunities for the community to interact with their history. Today, Waldomore remains a part of the library campus. The ground floor offers a large public meeting space alongside rooms that display period furnishings. The second floor houses the Clarksburg-Harrison Public Library's local history, genealogy, and special collections. Feel free to visit during our regular hours or contact us to schedule an appointment.